Welcome to The Hall of Blue Illumination, the podcast dedicated to the world of M.A.R. Barker’s Tékumel. In this episode our hosts welcome special guest Dave Morris. Dave is a legend in RPG circles, and among other things, the author of Tirikélu, a rule system for roleplaying on Tékumel. Dave relates some of his experiences with Tékumel, as well as some of his thoughts on roleplaying systems in general. [00:00:54] Dave tells us about his first experiences with Tékumel and Empire of the Petal Throne. EPT was Dave’s first encounter with a true RPG. [00:02:38] “You’re not Conan, you’re the bones that he crunches under his sandals as he climbs the temple steps.” Dave’s group originally played EPT with the referee giving each player a 30-minute turn. Dave describes this odd method of play and initial forays into the Temple of Hrúgga. [00:04:07] “Cooperatition.” Dave’s group had a culture of player-versus-player games, to the extent that their PCs took different sides during the civil war that followed the death of Emperor Hirkáne hiTlakotáni. Players actively working against other players goes against the assumptions of most RPG campaigns, where players are considered to be allies. [00:06:56] The Tékumel scene in England in the late 1970s. People were curious about Tékumel, and Dave’s group got so big that they almost had to turn players away. In the dark, barbarian days before the Internet, groups didn’t often compare notes on how they played. 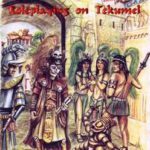 [00:09:50] Dave is the author of Tirikélu, a rules system of his own design created for the world of Tékumel and released in 1992. Dave describes his correspondence with Professor Barker, and how early hints at the system that would become Swords & Glory influenced the development of Tirikélu. [00:12:50] Dave uses GURPS 4th Edition now, although he’s concerned about how much emphasis it places on “roll-playing” and how slow it moves. Dave discusses what he likes about Tirikélu, including the speed with which combat is resolved. [00:15:23] Dave prefers systems where the results of player’s attempts at skills like Oratory aren’t wholly decided by die rolls. [00:16:15] Dave decided to rerelease Tirikélu because it was different from those subjects he was currently writing about. [00:17:47] It took Dave’s original group a while to get into Tékumel. He thinks that most people need a couple of passes with Tékumel to get it right. [00:18:53] He discusses how he likes smaller scale campaigns, that aren’t focused on grander themes like saving the world. [00:20:01] Players of younger generations don’t have as much experience with “science-fantasy” and Dave feels that they have trouble getting into it. [00:21:00] Dave discusses stealthily introducing his players to Tékumel. [00:21:35] “Don’t drop them in the deep end of the pool yet.” Victor has started a new Tékumel group, and it brought him to the realization that he should resist the urge to introduce players to the larger world of Tékumel right away. [00:22:40] Sometimes it’s useful to go back to basics. By seeing Tékumel through the eyes of someone new to the game, you can gain a different perspective on it. [00:25:30] Dave discusses the unique “moral” aspects of Tékumel, by comparing it to one of his own creations, Dragon Warriors. The gods of Tékumel aren’t really concerned about the lives or actions of player characters, and if things turn out poorly for the players, that’s just the way the dice fall. [00:26:48] The real world quality of Tékumel; it has a lot of breadth, as well as depth. People often get hung up on the depth of Tékumel, but it’s also very broad. You can set almost any kind of game in it. [00:29:33] An open, detailed world doesn’t appeal to every player. Sometimes players need a push in the right direction. In some ways, Dave was trying to replicate the vastness of Tékumel with his Fabled Lands setting. [00:31:30] Most campaigns nowadays start with players of (at least) middle-income status. Victor says that most of the Tsolyáni characters he’s played have been from higher status clans. [00:33:01] One of the strengths of GURPS is that it encourages players to cooperate in character creation and build their skills and backgrounds around supporting other player characters. [00:35:50] The depth and nuance of etiquette and social interaction on Tékumel can be a huge source of fun for experienced players. [00:39:11] “People on Tékumel are people.” The motivations of characters on Tékumel are the same as those for individuals in the real world. [00:49:09] Our hosts close out with plans to play a game of Tirikélu with Dave and report back. Empire of the Petal Throne is the original Tékumel sourcebook and rules set. It was first published by TSR in 1975. It can be purchased as a PDF from RPGNow. A print-on-demand edition will be released on October 16, 2017. Swords & Glory Vol. 2 is available as a PDF or in print from RPGNow. It provides an intricately detailed rules set for creating characters and gaming on Tékumel. Tirikélu is a rules set for role-playing on Tékumel, created by Dave Morris. It was originally published in The Eye of All-seeing Wonder, beginning in 1993. Dave released a second edition in July of 2017. The second edition is available as a free PDF here. For the curious and/or completists, a PDF of the original first edition is hosted here. For Dave’s notes on the rerelease of Tirikélu, as well as links to several scenarios, you should also check out his blog post on the subject. The Eye of All-Seeing Wonder was a Tékumel ‘zine authored and published by Dave Morris from 1992 to 1996. Every issue is available as a free download at Tekumel.com. Béthorm is your one-stop shop for Jeff Dee’s rules set for gaming on Tékumel. It’s available both in PDF and in print, and boasts a growing number of authorized supplements and adventures. Dragon Warriors, is a game system written by Dave Morris and Oliver Johnson, and first published in 1985 as a series of paperback books. This material was collected and rereleased by Mongoose Publishing in 2009. It is now available from Serpent King Games in print and PDF at DriveThruRPG. Fabled Lands was a series of gamebooks published by Pan Books between 1995 and 1996. They were originally written by Dave Morris and Jamie Thomson, and are currently in print from Megara Entertainment. GURPS or Generic Universal RolePlaying System is a rules system created and published by Steve Jackson games since 1986. It is currently in its Fourth Edition, and is widely available. The professor’s judgement in the case appears to be locked behind a WordPress password. Thanks for the heads up. I’ll move the files to Dropbox.